Walking around with a bunch of keys all day long makes it very easy to loose your keys, or at least some of it. It's New York, lets face it, a copy of your key is probably floating around somewhere with someone, the management company, the landlord, the construction company and god knows who else. 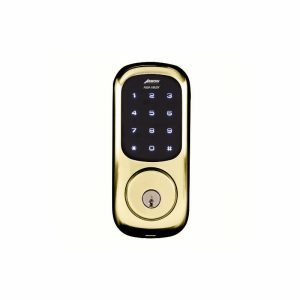 An easy way to eliminate some of those jiggling keys out of your life would be to install an electronic lock with a digital keypad that uses a code for access control instead of the actual key. Only those who have the code can open the door, you don't have to leave keys under the mat anymore or chase people down to get your keys back from them. At Metro Local Locksmith we specialize in electronic deadbolts and digital access control, it's easier than you think, you too can have a lock with a digital keypad that eliminate the need of a key all together. Although it doesn't take a key to unlock the door, only the access code, there's still a key as an emergency option to override the code in case you forgot it or if the battery dies. A lot of locksmith companies in New York City would offer a verity of electronic deadbolts and digital keypads, it is important to choose the right one though, you don't want to go with a locksmith company who can't get it done the right way, the first time. In a sea of craziness and dishonesty, Metro Locksmith is a light house of professionalism, honesty and transparency. Our online reputation is stellar and our Yelp reviews are one of the strongest testimonies of our character and craftsmanship. So when ever you're ready to move forward with your electronic lock installation and join us in 2017 where keys are no longer needed give us a call at Metro Local Locksmith and one of our technicians will be there 24 hours a day, 7 days a week to provide you with a free estimate of your new digital keypad deadbolt lock.